The Road to McCarthy: that’s a story! 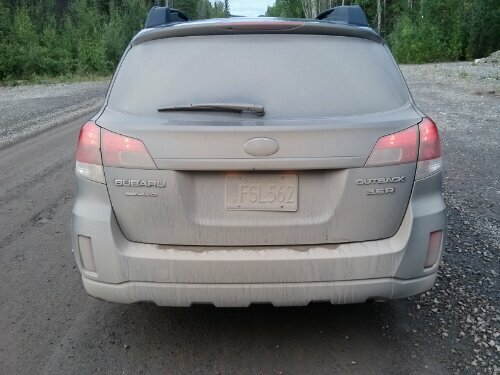 After photo-taking event in Chitina, we pulled the car around the corner to see the sign “Pavement Ends”. Then another sign that tells about McCathy road. 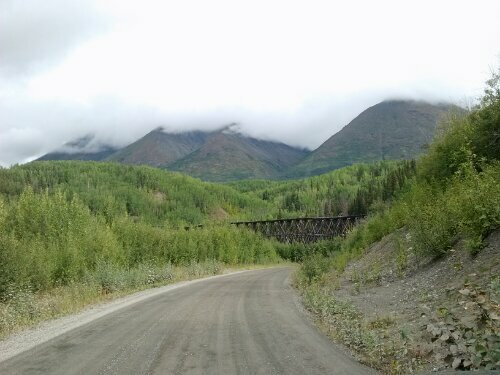 “Road ends at Kennicott River, 62Miles. Drive at you own risk. Watch out for loose railroad spikes. Noone seems to know why the misspelling, mystery? The sign make you wonder what you are doing. You can even see the pot holes from the sign. 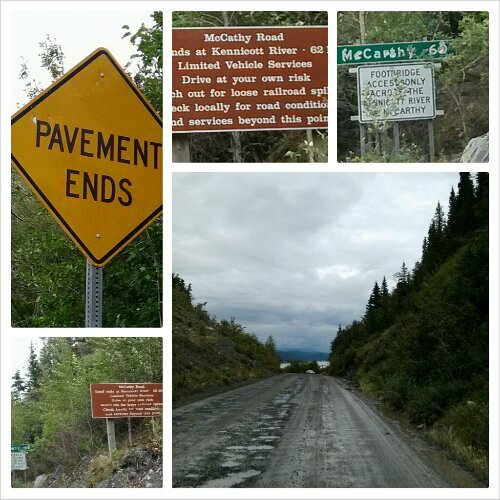 Well, we threw caution aside and drove the Road to McCarthy. Bless the road guys, except for a few sections with pot holes, the road was good, (not paved, but a good surface for a gravel road). Mostly two lanes wide, no guard rails(bit un-nerveing when a big RV is coming at you). Many challenges lay ahead for the we don’t like heights and wobbly bridges …lol.. We drove for 62 miles over hill and dale..or more specific, three bridges. 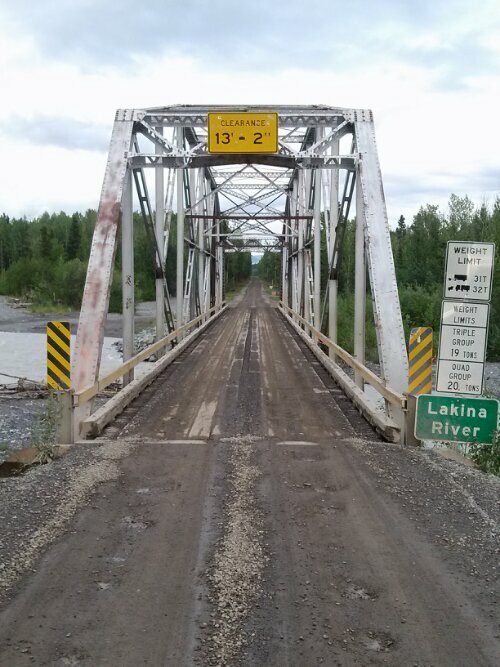 The Lakina River bridge, wood bridge. The car was making a funny noise, so Carol was driving, we pulled over and I climbed under to see what was stuck in wheel well. 20 minutes later and my whole left side was muddy, I found , nothing. But the sound was gone, thank God for that. (Paul, really nothing happened!) We were on our way. The silty mud sticks like concrete to my sweater. 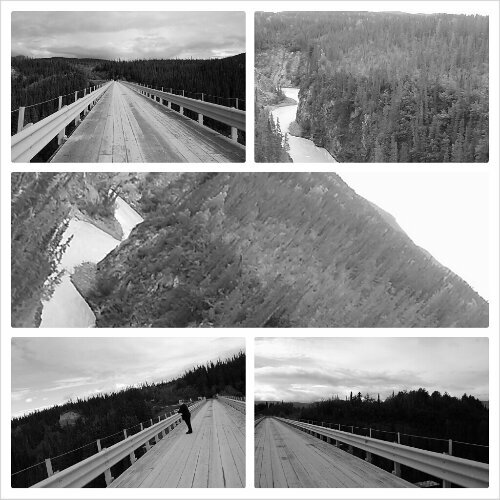 The next bridge was Kuskulana bridge, 283 feet from river…. vertigo! Wood slats to drive on and the guard rail doesn’t look sturdy. We made it without fainting. Then we drove to Currant Ridge Cabins. I walked into the office to pick up the keys, the owner asked if I was a local and why I was covered with mud. It took me several minutes to stop laughing to tell my story. My first year in Alaska 1995 when I drove the road I indeed found a railroad spike…in my tire. To top that one when I finished changing the tire there was a black bear in front of my car sleeping! 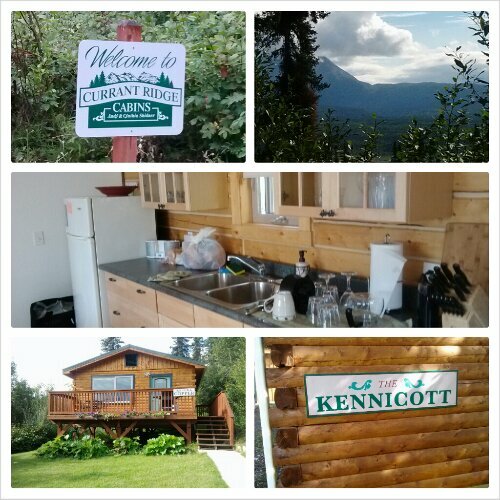 Never left Alaska since that job in 95 and now living up North in Livengood in a cabin in the woods. Been a long way since that sleeping bear..now they come right to the door but no bear spray..the 44mag is my new Alaskan way. Enjoying your blog! First time I crossed the Kuskalana bridge was in 1971. It was without any side rails then and you could see thru some of the planking! That is if you were brave enough to go out on it. I just closed my eyes as my husband drove us across. Thanks for the kind words about our B&B. ( WILLOW LAKE B&B) I will continue and follow your trip. Have fun.